Chandra Cohen explains what students can learn in 9-day-Vedanta-Courses. He talks about the syllabus – and what the knowledge will be good for. Chandra teaches 9-day Vedanta Courses in Yoga Vidya Ashram Germany. Usually he uses a Classical Scripture as main text, like Aparoksha Anubhuti, Tattwa Bodha and Atma Bodha of Sankara or the Upanishads . Vedanta is often taught in stories. In this Vedanta Podcast, Chandra Cohen tells his favorite Vedanta story. This story is about the Creator, Prajapati. The King of Gods, Indra, and the King of Demons, Virochana, approached Prajapati, to receive Knowledge. Chandra explains, how Prajapati taught, and how Indra gained the Highest Knowledge, while Virochana remained in ignorance. 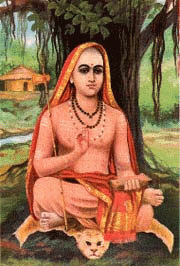 This story comes from the Upanishads, and was commented by Sankara. Masters like Swami Sivananda, Ramakrishna and Swami Dayananda told this story in many variations. Chandra has a very lively and profound way, to tell this story. And you will get some insight on the main question of life: Who am I? This Vedanta Podcast episode is the first a series of short answers of Chandra to questions posed by Sukadev of Yoga Vidya Ashram Germany.